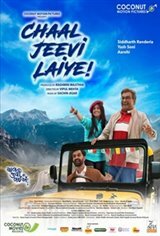 (Let's Live) is a 2019 Gujarati language comedy-drama road film written and directed by Vipul Mehta. In his quest to become a successful entrepreneur, Aditya Parikh puts life on the back burner, including his father Bipin Chandra Parikh who has been diagnosed with pontine glioma. Aditya agrees to take his father to Uttarakhand to fulfill his last wishes where they accidentally meet a backpacker named Ketki Mehta. The journey turns out to be an experience with surprises and realizations of their way to happiness and closeness.